In 2019, Middle Eastern flavours will continue to inspire passion on the palate. Zesty za'atar (za-ah-tar) is a very popular spice mix in Syria, Jordan, Lebanon, Palestine, Israel and Turkey. It's a blend of toasted sesame seeds, thyme, oregano and marjoram with one secret ingredient: SUMAC, a tangy, lemony dried herb that you can buy at most grocery and bulk spice outlets. We recommend sprinkling za'atar and a drizzle of any one of our fresh olive oils on your favourite meats, fish, eggs, veggies and pastas. In a mixing bowl, combine olive oils, balsamic and za'atar spice mix. Place chicken in bowl and cover completely with the mixture, pressing into and under the skin. Cover and place in fridge for at least two hours (or overnight). Preheat oven to 400 degrees. Transfer the chicken and marinade to a sheet pan with sides or a cast iron skillet. Add garlic bulbs face down onto your sheet pan or skillet. Roast 40 minutes until done. 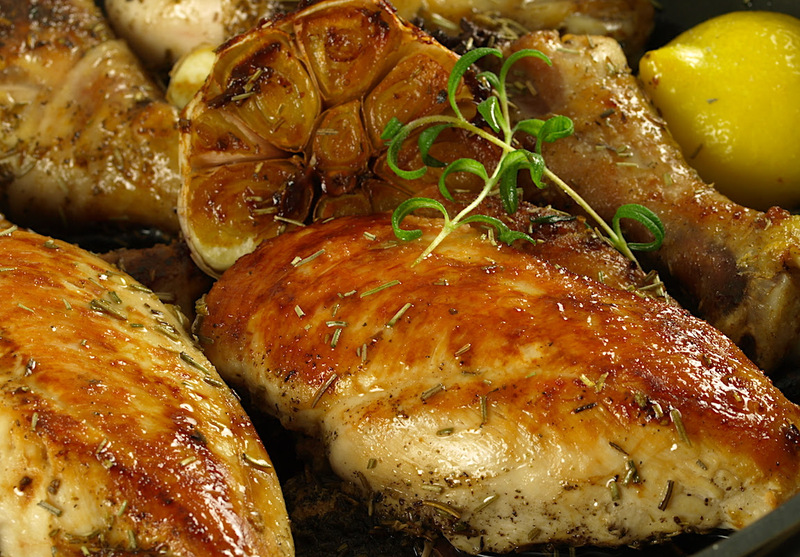 Consider removing the chicken breasts after 30 minutes since white meat cooks faster than dark. Garnish with fresh parsley. Drizzle Garlic oil and Lemon balsamic to taste. Serve over bed of arugula or rice. You can simply shake these ingredients together in a spice jar or grind them in a spice grinder for a finer powder. Some mixes exclude marjoram and oregano and less sumac. But if you like the flavor of these herbs, go right ahead and include them.